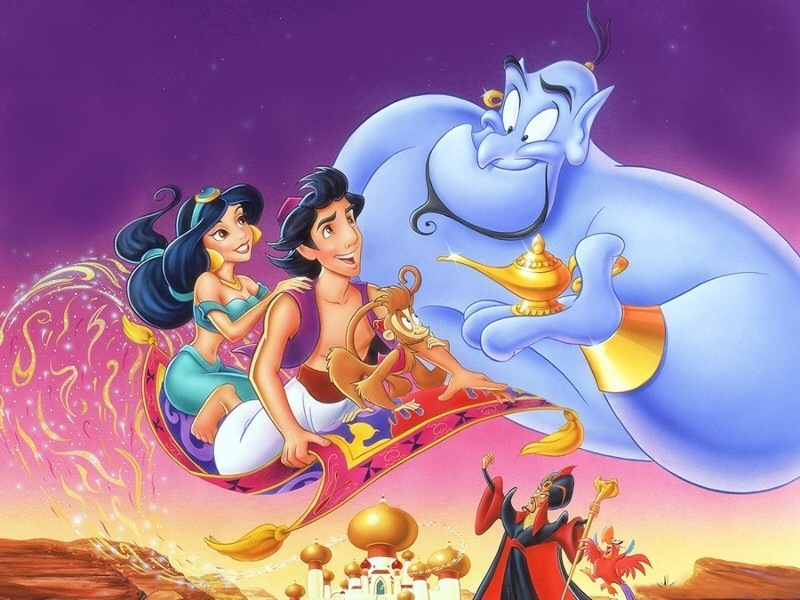 Aladdin stands the test of time as one of the best and most beloved Disney films ever made. It stands shoulder-to-shoulder with the early classics like Sleeping Beauty and Pinocchio, as well as the most recent icons like Toy Story and Frozen. The film has pretty much everything you could ever want in a family movie, in a musical adventure, and definitely a Disney film. If you were to go down a checklist of everything that makes for a good movie, Aladdin would likely hit all the marks. Great music. Memorable performances. Fantastic art. Everything that makes Disney movies fun is on display here. For the 31st entry into Disney’s animated catalog, the film studio would deviate from European fairy tales and look to the cradle of civilization. Drawing from the tale of Aladdin and the Magic Lamp (dubiously attributed to 1001 Arabian Nights), the story follows a young street urchin who finds a magic lamp within which lives a genie that will grant wishes. The Disney version deviates heavily from the original form of the tale. Gone are characters like Aladdin’s mother and the genie of the ring, and added are limitations to the genie’s power (in the original tale, genies can grant as many wishes as are asked of them). Likewise, characters are radically altered. Aladdin is not Chinese in this version of the story but appears Persian (the Middle East is made up of multiple ethnic groups; Persian and Arabic being principally amongst them, but I digress…) while the genie of the lamp is not a captured and enslaved demon but a fun-loving and jovial kidder. One of the icons of the Disney Renaissance (a period of renewed creative and commercial success stretching from the Little Mermaid in 1989 through Mulan in 1998), Aladdin would be one of Disney’s most successful films of all time. It would go on to win two Academy Awards and gross over half a billion dollars. The crux of the story – vagabond nobody finds a lamp, gets his wishes granted, and then troubles ensue – is preserved and even improved upon. The original version of the tale underscores the value of having what you want,while the Disney version of the tale includes the morality lesson that getting everything you want may not quite be all it’s cracked up to be. The tale in general is expertly done, showing not telling, and with plenty of comedy and action to keep the movie going at a great pace. While it’s true that Disney’s history of whitewashing fairy tales isn’t an exaggeration, it is worth noting that this movie pretty firmly presents it’s entire cast as Persian, if at least not generically Middle Eastern. Likewise, the story is pretty obviously set in an Islamic locale, details which should not be overlooked. Disney’s art is always excellent but the backgrounds and characters in Aladdin are a cut above. The characters are streamlined and simple,mute flawless and distinctive. The backgrounds are lush and gorgeous, capturing an idealized but not wholly inaccurate depiction of the Islamic Golden Age. While Disney didn’t invent animation, they sure perfected it. Nowhere is this better on display then in Aladdin. Some of the smoothest and more natural-looking animation every set to screen is on display. The smallest movements by characters like Jasmine and Aladdin are subtle masterpieces in the craft. Students of the game of animation will find something new to be amazed by every single time they watch this movie. The characters in Aladdin are bright and sunny but very real. Aladdin is the embodiment of the good-hearted petty thief. The genie is a riot and a half, while Jafar is a delightfully evil villain. The outstanding character, though, is Jasmine. While she may not have originated the mold-breaking rebellious princess archetype, she may have helped perfect it. Between her vaulting between buildings every bit as good as Aladdin to him calling him out on his sexist notions, Jasmine stands alongside the likes of Princess Leia and Jem as an icon of female empowerment. Disney signed up an impressive cast of voice actors, many of whom turned in career-defining performances. Linda Larkin would be named a Disney Legend for her performance as Jasmine, while Scott Weinger and Jonathan Freeman would help to sculpt Aladdin and Jafar respectively. They all pale, however, in comparison to one of the single best performances of the tragically late Robin Williams’ career. The Genie remains one of the most iconic Disney characters of all time, due almost single-handedly to Williams’ masterfully frenetic performance. Jumping through multiple gags, jokes, and impersonations – at times all in the same sentence – he delivered a performance that absolutely defined the character and completely stole the show. Somebody always finds something to complain about with Aladdin. There’s always some element that could have been a little bit more perfect. But at the end of the day, that’s what you have here: a perfect movie. It hits all the notes and hits them masterfully. From gorgeous animation to an ambitious story to showcasing the talents of one of the greatest comedians of all time, this is one of the best movies of all time, animated or otherwise. Next Next post: Knights episode 02 is Live!! !